A team of NASA and Johns Hopkins University Applied Physics Laboratory researchers discovered that meteoroid streams passing through the moon could briefly disseminate small amounts of water vapor on the lunar exosphere. NASA’s Lunar Atmosphere and Dust Environment Explorer spacecraft helped the team observe the phenomenon which may lead to the use of lunar water as a resource for long-term space missions, the laboratory said Monday. Researchers used data obtained by LADEE on the moon’s thin gaseous layer and determined that meteoroid streams were able to produce water concentration levels of 200 to 500 parts per million, which is lower than the dryest soil on Earth. APL noted that future missions to the moon may focus on calculating the amount of “water” or H2O and OH components that might be distributed from meteoroid impacts. LADEE, created and managed by NASA’s Ames Research Center, deployed a Goddard Space Flight Center-built Neutral Mass Spectrometer as part of the mission. 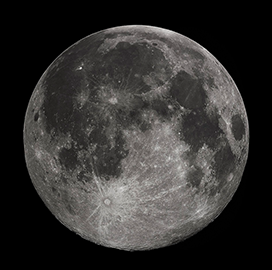 The spacecraft orbited the moon between October 2013 and April 2014.